I was still a chef when I started to be interested in wine, I attended tastings and was impressed by the diversity of wine before I saw a documentary about a sommelier competition and I was consequently really impressed by the skills of the sommeliers even if I never ever thought I would be one of them. I never had one role model, I always looked to several persons for their qualities and personalities. Regarding the professional performance I always said that regardless of the hardware which is knowledge I think that the software (communication, language skills, authority, humour, the ability to read a guest) is more important, it doesn´t matter what you know if you can´t communicate it. Just be open minded and talk to people, there’s plenty of opportunities to find jobs and to learn with the best. I always had the fortunate position of having open minded clients that came and sat down and said let´s go! Which is what fine dining to day is all about in my view, having the whole experience with the food and wine pairings. Otherwise, I ask the guest for preferences and some kind of budget, when you work with a big list it´s impossible to have recommendations apart from your by the glass list. What’s your philosophy about glasses? Are you working with well known brands or are you considering new brands as well and how do you determine? That was always something depending on the restaurant, I mostly worked with glasses I liked with a few exceptions. Today there´s a vast plethora of excellent glasses to chose from. Taste the wine and taste the food and if you like it it´s good, I try to avoid too much of a scientific approach even though I really enjoy teaching it to students both chefs and sommeliers as I´m not only a sommelier but also a chef and mainly a food and wine lover working with this every day. 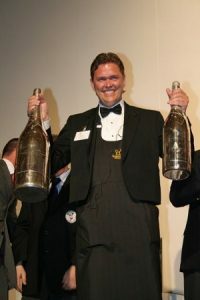 Of course, we´re there to check the quality even if we´re not supposed to drink a mouthful of the guests expensive wine. Just go around to restaurants and wine bars and tastings and talk to people, there´s a lot of opportunities. The list must be adapted to the needs of the restaurants and also adapted to what the clients want, you can´t be too ego about the funky, cool and hip wines that only you and your colleagues like. I always had a discussion with the owners before starting a new venture as I wouldn´t be able to worl with fixed markups like 300 or 400 %. I think the key is flexibility, you can charge more for certain wines and less for finer and more expensive wines, that was always my point of view, then of course, it´s more expensive to run a 2 star restaurant at a good address that a cool wine bar in the suburbs so we can´t look only at price alone. You can´t do everything so I chose to do what I like, and where work takes me and leave out some regions, wine styles, trends that I find less interesting or things that are already well established. Well I taste a lot of wine and I travel a lot so there´s plenty of new wine, the issue to find an importer unless you want to bring it in yourself which is another time consuming activity I still left out. At home always Riesling Kabinett or dry Austrian, Vosne-Romanée or similar style of silky, perfumed Burgundy and of course loads of Champagne.